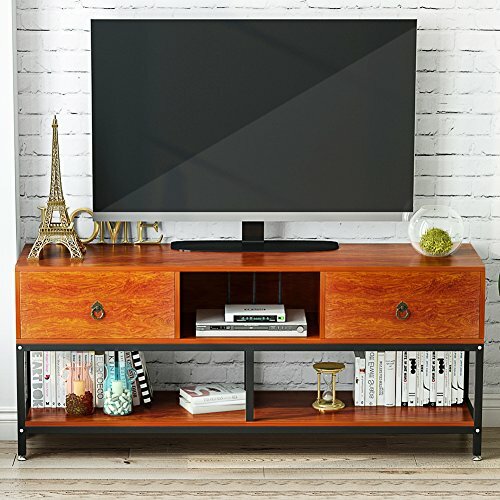 Elevate the Look of Your Living Room with this 3 Tier Media Stand. Middle Shelf with Two Big Drawers and Bottom Shelf are Spacious Enough to Keep DVD, Games, Gaming Systems, and Other Essentials. 【SUPER STURDY TELEVISION STAND】: mechanical design and powder-coated steel frame ensure stability and durability, no serious shake or movement. Table weights about 88 lbs; Maximum load capacity 180 lbs. 【3-TIER STRONG COLLECTION CAPACITY】: two big drawers for concealed storage, open concept shelves for all of your media needs from your cable box to your DVD player. Wide desktop with spacious space to storage your daily items, all making your home tidy and clean. 【HOLDS TV'S UP TO 60"】: Large size 59.1"(L) x 15.7"(W) x 23.6"(H) (L*W*H); super large desktop hold TV's up to 59", two big drawers come with built-in metal runners and safety stops, easy to slide in and out and no worry to fall down. 【HIGH QUALITY & DURABLE MATERIAL】:thick panel is made of E1 environmental protection particle wood with high glossy finish and very smooth, resistance on scratch, friction, high temperature, clean easy and water-proof, you don't have to worry about damaged wood. Adjustable desk feet for different height need, uneven ground conditions(keep balance) and protect the floor from scratch. 【ASSEMBLE EASILY】:assembly and disassemble is a breeze and all tools and step by step instructions needed are included, no need a electric drill to assemble this desk. We offer 1 year warranty and friendly customer service, if there is any questions please feel free to contact with us.